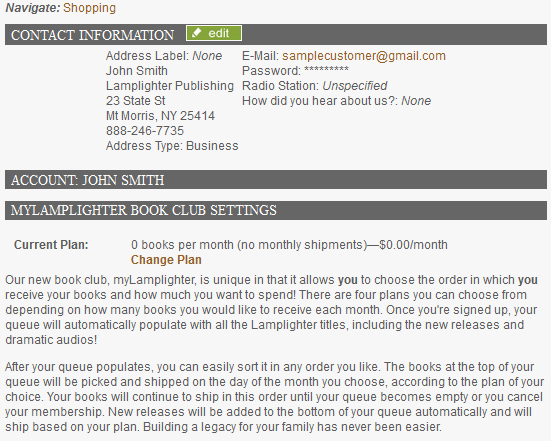 myLamplighter provides an opportunity to build your own library of Lamplighter stories in an affordable way while customizing the plan to fit your needs. Add, delete, or reorder items in your queue by clicking the “Manage Queue” link. 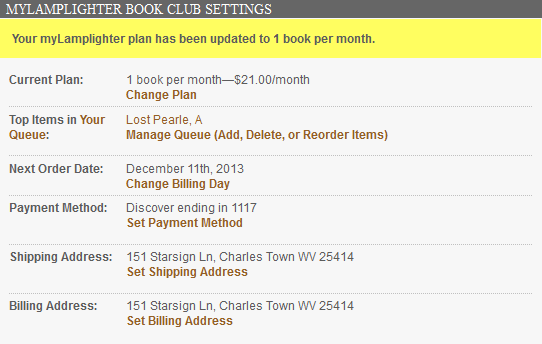 Change the day your orders are placed by clicking the “Change Billing Day” link. Change which of your saved addresses your orders are billed and shipped to by clicking the “Set Shipping Address” and “Set Billing Address” links. Follow these detailed instructions to get started with myLamplighter! 3. Once you’ve selected your plan, click “Change Plan” to save your changes. You will be returned to the main myLamplighter settings screen.